I can see this being an amber ale...but I must say it's a slightly odd choice of style for a coffee beer. Pours an ambery color with a BIG 3+ finger of head. Be careful, pour gently...the head can get out of hand. The aroma is definitely comprised of coffee. There's some nutty malt sweetness as well. Not much in the way of hops, though, once you throw coffee into the mix, a hoppy red may not be best. Tastes of roast and a more milder coffee than in the aroma. Slight bitter finish with some maltiness. The feel is crisp and from the pour, a bit over carbonated. There's some stinginess too it and the body is more light. Interesting, but It's not all there. I think something like this can work, but this definitely needs more of it. Enjoyed from the bottle in a snifter glass. This unique ale pours a hazy amber with a very nice head of dissipating foam that forms a thin layer and a thick ring with great lacing. Nose of light coffee, light caramel, moderate hop bitterness, and earthy goodness from most likely the yeast. Flavors surpass the nose with lightly sweet caramel notes, light cold brewed coffee, and earthy, lightly piney, hop bitterness that helps round this one out. Effervescent mouth feel sears in the flavors of the hops and coffee on the aftertaste, while still maintaining a seat in the refreshing category.....refreshing mainly because of it's uniqueness. Very solid and a welcome addition to an excellent brewers profile. Smells like hot pickles - seriously. Fortunately I love pickles and am not put off by this. Pours and retains a 2 finger head in a Bell's snifter. Tastes somewhat like mild vinegar and saison. Not registering the coffee at all, but enjoying the unique flavor. Acidic without being a jerk about it, and no salty/sour vibes. Just vinegar in a somewhat good way. Paid $6 for a single 11.2oz. I might do it again when I'm bored. *edit* It has occurred to me that I drank this well after the 'best by' date, so I can't fault Bouwerij De Molen for off flavors at this point. One of those coffee beers that isn't brown or black. This one is amber. 1/2" of head. Coffee is quite enjoyable, does make me think breakfast. Mild drinking, light body to it. Shows off the coffee for sure. Mouthfeel could be a little thicker, I get it though, mild, easy, breakfast. Price is a little much for a single, that's why even though this is good, it can't be too often of a purchase, cost/value analysis says awww. . .
Like I've said before, hops and coffee aren't a natural match. In this case of a drier beer, maybe even less so. Poured at a good temperature with an absolutely mammoth amount of froth in a cream colored head that soon settled down and lots of clingy lace. Color is a hazy amber with lots of bubble trails. Aroma is coffee, hop, minerals, malt. Flavor's very similar to nose, quite dry, some cereal, with carbonic tang and hop bitter working better than I would've thought, though still, just not good. Body n carbonation are decent. Finish is like flavor, and so too long. Never get another. A rocky off white head erupts from the copper body with golden hues and is very slow to dissipate amongst the lively bubbles of carbonation. Quite a unique aroma of fresh hops and ground coffee floats from the glass with touches of yeast. The hops seem earthy and citrus but tough to clearly define amidst the coffee aromas. The taste is similar featuring coffee grounds, citrus hops, and hints bread as it warms. There even seems to be hints of peppers, but not overly spicy, perhaps it’s a left over from the burnt coffee. Medium to light in body with abundant carbonation and a drying finish. This beer is unlike any I have had. The contrasting aromas and appearance really throw the senses off versus what you would expect from a beer heavy in coffee character or of this color. It is tasty though. Done in a horizontal tasting with Koppi Coffee IPA from Mikkeller and Sleep Over Coffee IIPA from To Ol. Eye: This one pours the clearest of the three, orange hued with active carbonation. Huge rocky head foams up when poured and as it recedes leaves nice lacing along the walls of the glass. This one looks the best of the three. Nose: Big coffee aroma in this one, I know its not an IPA but, the coffee is the dominant aroma here. Very nice. Rich coffee aroma. This one has the kind of coffee aroma that you would find in Founders Breakfast stout, bold strong and in your face. Tongue: LIght body and overall just thin. I feel like this one is quite watery compared to the other two. There is coffee flavor in here, but I feel like its just watery, there doesn't seem to be much to back it up. Carbonation is higher than it should be. There really isn't much to this beer other than the coffee, I might as well drink a cup of coffee, no complexity whatsoever. I'm left wanting more, huge let down. Drinkability: Overall this is a beer that I won't write home about, nothing really grand about it. I prolly won't buy this one again...it was worth the try but nothing coming back to. Out of the three this one is the weakest and my least favorite. If you want single minded go for the Mikkeller, if you want something more complex go for the Sleep Over IIPA. Really big frothy beige head which streams over the top of the lass on top of a clear bubbly amber body. Aroma is straight-up bitter spent espresso grounds. Some light caramel malts and bready notes. The dry hopping is evident with some citrus, but the coffee really stands out. Taste is really bitter with a combination of hop bitterness and scathing iced espresso bitterness. Malts are present but really overshadowed by the burnt coffee grounds, which linger in the finish. Mouthfeel is overcarbonated. Light body and generally effervescent. I'm a big coffee beer fan so I think I like this one better than most people. It is way overcarbonated, otherwise I would rate it even higher. A: Poured from a bottle to a pint glass. Had an amber color and a cloudy consistency. There was a massive, fluffy, long-lasting head. Good lacing. S: An interesting aroma of coffee, chilis, and some chocolate. T: Certainly not what I was expecting: A big heap of chili peppers, a bit of coffee, some cocoa, and a bit of malt and chocolate. It's an odd combination, but oddly likeable. M: A good amount of carbonation with a smooth finish. The chili peppers give a little burn on the way down. Medium-bodied. O: This is definitely an oddball beer. I don't know if I'd call it an amber/red ale (I don't know what I'd call it), but it's definitely worth a shot. I was intrigued by this so I plopped down the $6 to give it a try. Immediately upon cracking the cap, it is apperant that I have a gusher. After quickly transferring it to the sink, I poured carefully in a Great Lakes snifter. Appearance is cloudy reddish orange with loads of loose foamy head which crowns above the glass. Nose features bitter coffee grounds along with earthy hops. The aroma is kind of strange. Almost smells like there is an astringency in there. The taste is bizarre. Very light flavored up front with a very neutral flavor. There is chili there, but it doesn't really contribute any heat. Coffee comes through by the middle and makes for a bitter finish. The coffee doesn't provide any of the roastiness or depth I expect, its almost more of an earthiness that pairs weird with the hops. Mouthfeel is light and prickly. Very high on the carbonation side. Overall, I'm not sure if this beer is in the condition it is intended to be by the brewer. It certainly isn't sour, but it tastes a little off. I'm feeling like this one was a waste of money. Amber in color with an off-white head. A mild smokiness, strangely, but maybe it’s just the coffee? There is a fair amount of coffee and some bready malt along with a subtle earthy and floral hop note. The flavors are sort of muted due to the beer being so overcarbonated. A bit of coffee, bread, and a light toffee character. A strange idea and the flavor lives up to the strangeness of it. 330ml bottle served in a pint glass. Poured into a Gulden Draak Tulip. Pours a medium orange amber. Active carbonation with a one finger lively medium off-white head that dissipates somewhat to a thick ring leaving nice lacing. Strange aroma of malt, vegetables and coffee. Flavor is quite astringent and very bitter. Faint malt and dark fruit is overwhelmed by dry, somewhat smoky bitterness. 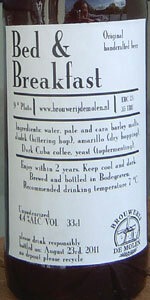 Astringent bitter finish with a light coffee component. Phenolic band-aid flavor is too strong. The bitter component of coffee is present without a mitigating earthy, herbal component. Light to medium bodied. I like this brewery, but this is a complete miss for me. I couldn't finish a glass. 33cl bottle into a matching De Molen snifter. The brew appears a clear copper color with an erruption of carbonation that fills the glass with 4 fingers white froth. The cap is slow to fade leaving patchy webs sticking to the glass. The streaming carbonation changes the brew from perfectly clear to chunky as it strips trub from the bottom of the glass. The aroma is primarily green bell peppers mixed with almost a spicy chili and plenty of tin-like carbonic quality. The most faint stale coffee inclusion is noted across the back with an herbal element of hops that just doesnt blend well together. The flavor is very carbonic tasting tin-like metallic and faintly bitter and herbal with hops. Aa bit of a vegetative flavor is present almost like the previously mention aromatics of green bell peppers. There is a sort of stale bread flavor mid palate that transitions into almost a buttery flavor in the aftertaste. This is a medium to lighter bodied brew with way too much carbonation. Everything about this brew clashes and its not that enjoyable. This is a rare miss from De Molen and should be avoided. Hey its another coffee beer that isn't a brown ale or a stout, I can dig that, but after the Mikkeller Coffee ipa, I'm a little leery. This one pours like a standard amber colored beer with a nice 5/8" head on the top of it. The coffee aroma is present and more than adequate, enjoyable, nothing too exotic about it, just straight up coffee and waffles type of aroma, perfect for a moniker like bed & breakfast. Taste, pretty easy drinking, in a way, I was a little disappointed it wasn't more robust, for the $5.49 price tag on something like this, but I didn't buy it because I truly thought it was going to be "worth" the price, but moreso to satiate my ticking curiosity. A little bit of that Denny's diner thing going on, some old school waffle and stale ash from the cigarrete tray thing going on with the wafting coffee aroma. I enjoyed it. If it was say, $6 for a 4 pack, it would be a repeat purchase, but at alsmot that much for a single 11oz bottle, well, its a good beer, but not worth the price. Spoil yourself on an early morning fishing trip and try it sometime.